I’ll get this out of the way first: Apple’s 2nd-generation AirPods are nearly identical to their predecessors. If you already own a pair of the company’s first-generation wireless earbuds, you should probably skip their successors. That said, if you’ve been on the fence about Apple’s average sounding but convenient earbuds, this is a perfect opportunity to pick them up. With this in mind, it’s difficult not to be disappointed with the new AirPods, primarily because Apple reportedly planned to release them in 2018, but likely pushed them back so that they could drop at the same time as the now dead AirPower wireless charger. 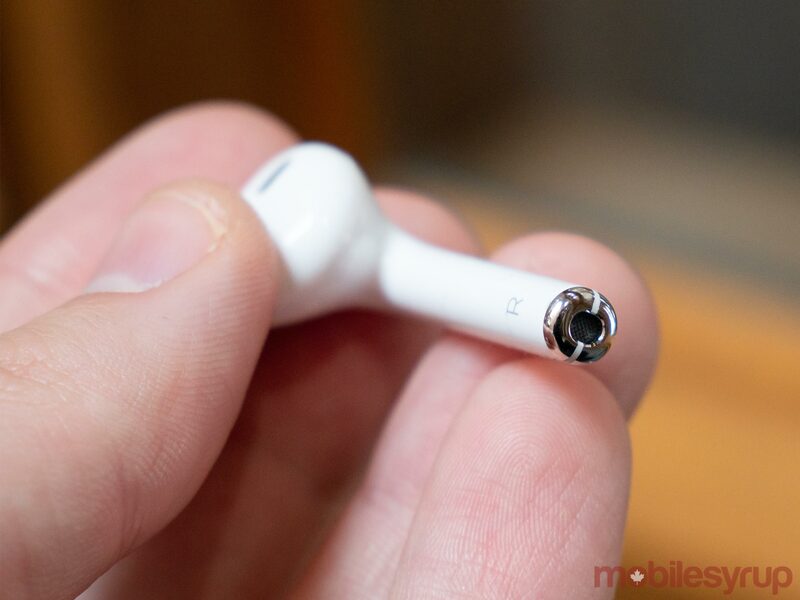 Often-requested features like noise isolation and IP68 water resistance in both the earbuds and their charging case have not made their way to Apple’s 2nd-generation wireless earbuds. 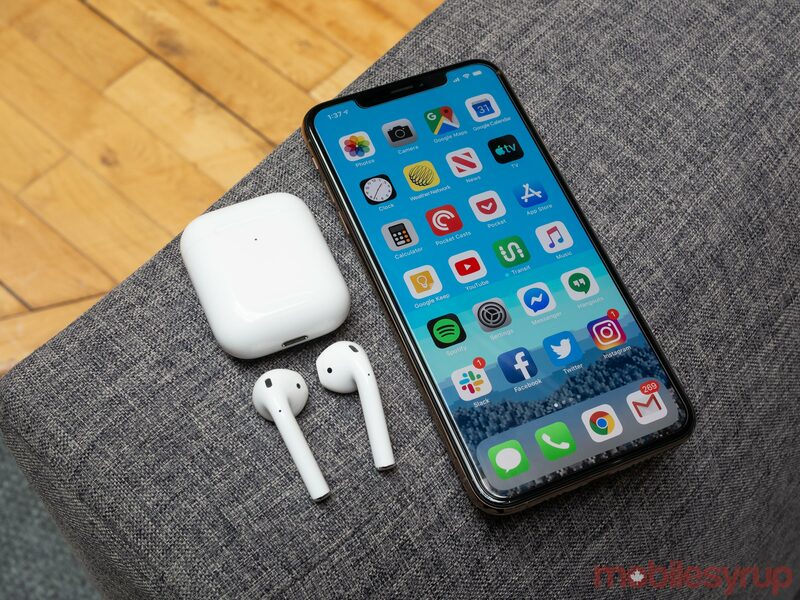 Instead, the refreshed AirPods feature a new H1 chip, hands-free ‘Hey Siri’ functionality, more talk time and faster Bluetooth connection speed. 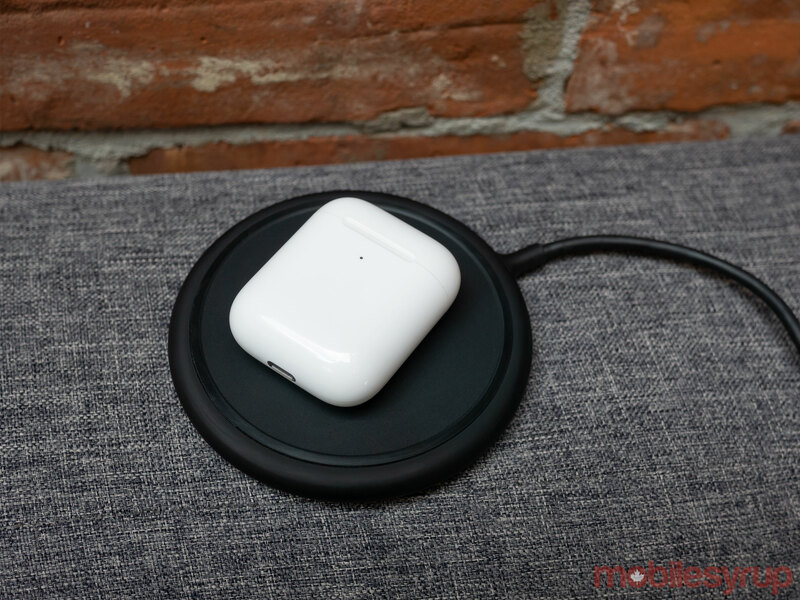 The most significant update is the addition of an optional wireless Qi charging case, allowing you to charge the headphones on any Qi-compatible wireless charging pad. Apple’s AirPods (2019) look identical to their predecessor. This means if you thought AirPods were strange back in 2017 when they first launched, your opinion will not change with this refresh. I’ve always argued that wireless earbuds, in general, have a strange aesthetic, particularly Samsung’s Galaxy Buds. Given the mainstream success of the AirPods, the earbuds are far more common than they were a few years ago. When I walk to work I encounter at least 15 to 20 people wearing AirPods on a typical day. In a way, this has helped normalize the wireless earbuds’ stark, white, earring-like aesthetic. 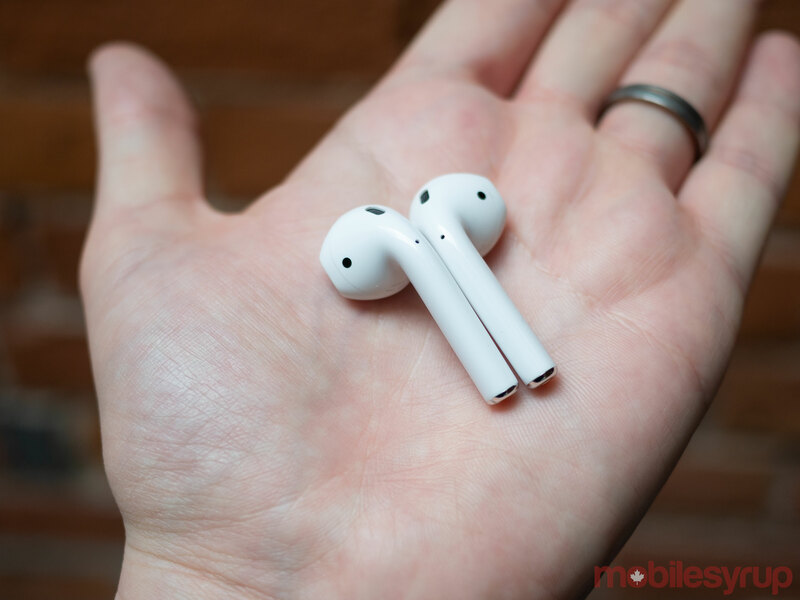 Make no mistake though, the AirPods continue to resemble Apple’s standard EarPods with the wires cut off. The AirPods’ charging case also remains identical with a few exceptions. First, the magnetic case now features Qi wireless charging that generally works great, but can be a little finicky depending on what charger you’re using. For instance, I needed to carefully place the AirPods charging case directly on the centre of the Mophie Stream Pad+ I tested it with. Of course the same can be said about charging any device capable of being wirelessly charged. It’s also important to note that charging the AirPods wirelessly is slow, coming in at just 5 watts. Because of this, it can take up to three and a half hours to charge the AirPods wirelessly, with it only taking two hours to charge the earbuds with Lightning. It’s also impossible for me not to get a kick out of charging the AirPods wirelessly on the back of a Galaxy S10 with Samsung’s ‘Wireless PowerShare’ feature. Apple is rumoured to be bringing similar functionality to the iPhone XS series’ successor. The charging case’s light has also shifted to the case’s exterior and only turns on briefly when you first place it on a charger. Because of this, there were instances where the AirPods were charging, but I assumed they weren’t because the light flipped off. I expect other people to make the same mistake, at least at first. Moreover, I can’t help but wish Apple would release its AirPods in more varied colours like the company does with its Beats headphones brand; a pair of black AirPods would be super sleek. Apple could be saving additional AirPod shades for the inevitable third version of the earbuds. It’s also worth noting depending on the shape of your ears, Apple’s AirPods still won’t fit snuggly, especially in situations in which you might move around a lot. As a result, those that may have intend to use the wireless earbuds while exercising might be better off waiting for Apple’s $329 wireless Powerbeats Pro to drop in Canada. The Powerbeats Pro feature a wrap-around design rather than a standard earbud like the AirPods. I’ve never really found the AirPods falling out of my ears to be a major issue because in-ear earbuds have always felt uncomfortable to me. As a result, I appreciate Apple’s insistence on sticking with the more comfortable but less secure classic earbud design. The best part of Apple’s AirPods is that they simply just work when it comes to connectivity. After the initial pairing process is complete, all you need to do is pop the headphones out of their charging case and place them in your ears to instantly connect to your paired iOS device. 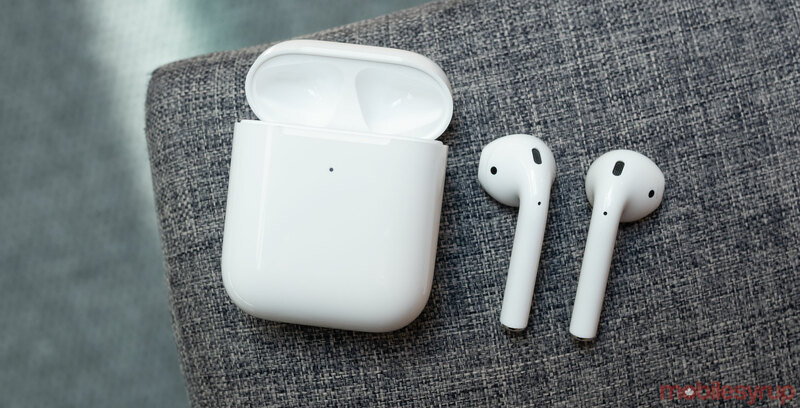 What has changed over the last few years is other headphone manufacturers are now catching up with the AirPods’ convenience factor, and are also often selling their wireless earbuds at a cheaper price tag. For instance, if you want the complete second-generation AirPods experience, you’ll need to drop $269 CAD. Samsung’s arguably almost as good Galaxy Buds (which also include noise isolation), on the other hand, cost $199. Of course, if you’re an iOS user, the Galaxy Buds likely aren’t even on your radar since they work best with Samsung smartphones when it comes to their instant Bluetooth connection features. 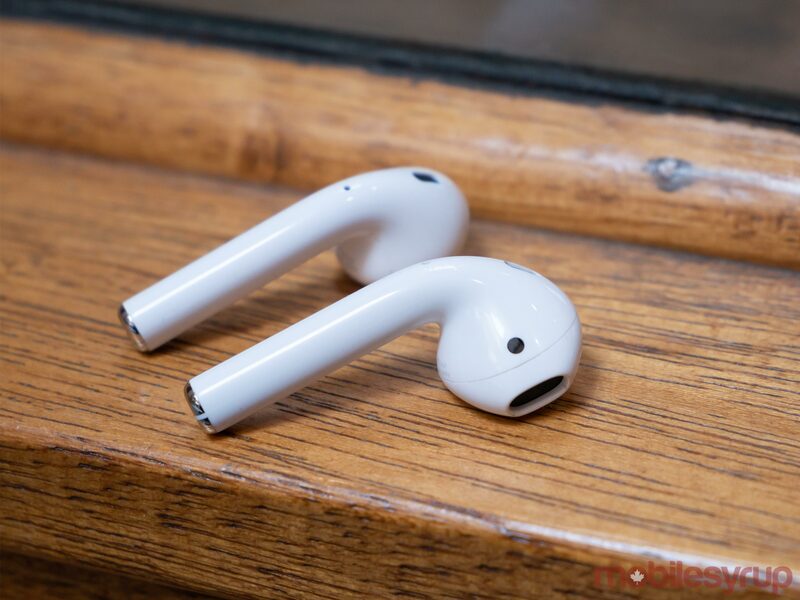 The same argument can be made about Apple’s AirPods when connecting them to Android devices. The magic of Apple’s wireless earbuds is only apparent with iOS devices. While the AirPods (2019) work with Android devices, the instant connectivity powered by Apple’s new, slightly faster H1 chip is gone. There are other positively reviewed similar wireless earbud options out there too, with the $219 Jabra Elite 65t and the somewhat pricey $379 Sennheiser Momentum earbuds being the most notable examples. Even Amazon is reportedly looking to get into the wireless earbuds game, according to a recent report. 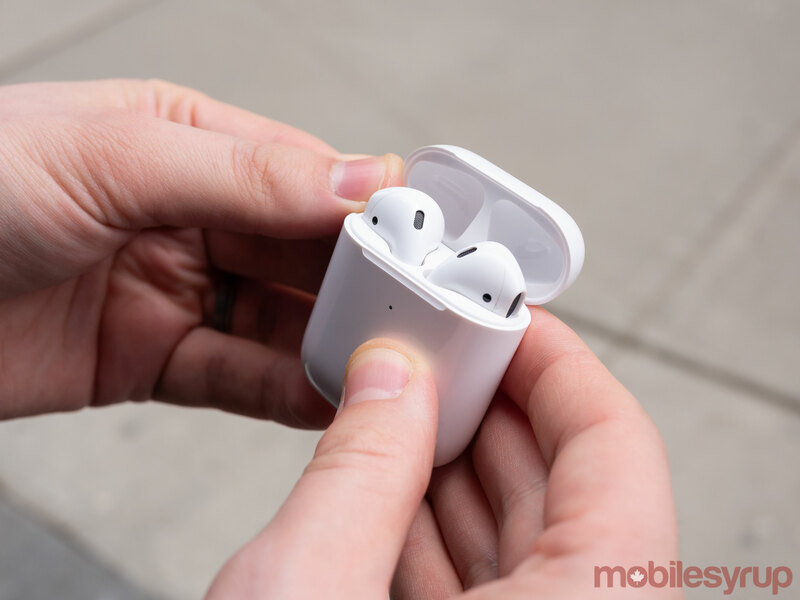 While Apple’s AirPods are still arguably some of the best wireless earbuds around, the space is quickly becoming increasingly competitive. 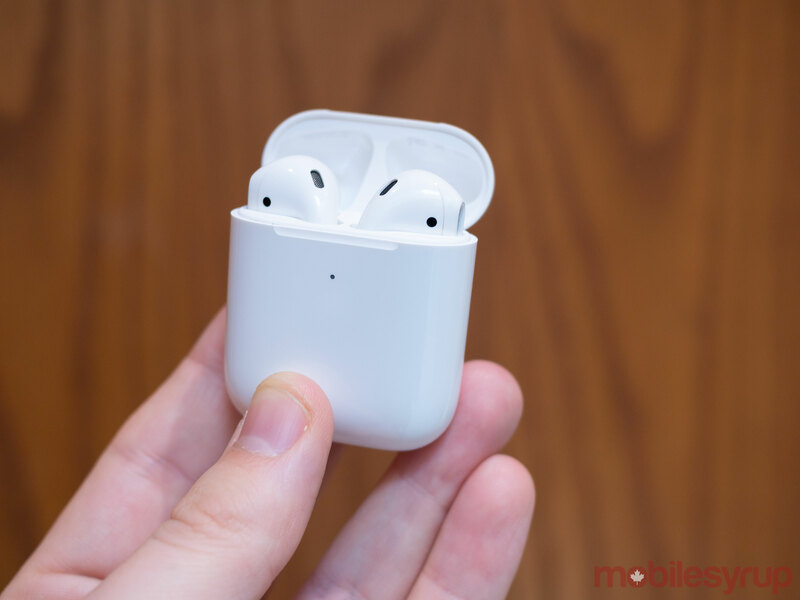 Beyond wireless charging, which I’ve already discussed above, little is new about Apple’s second-generation AirPods. 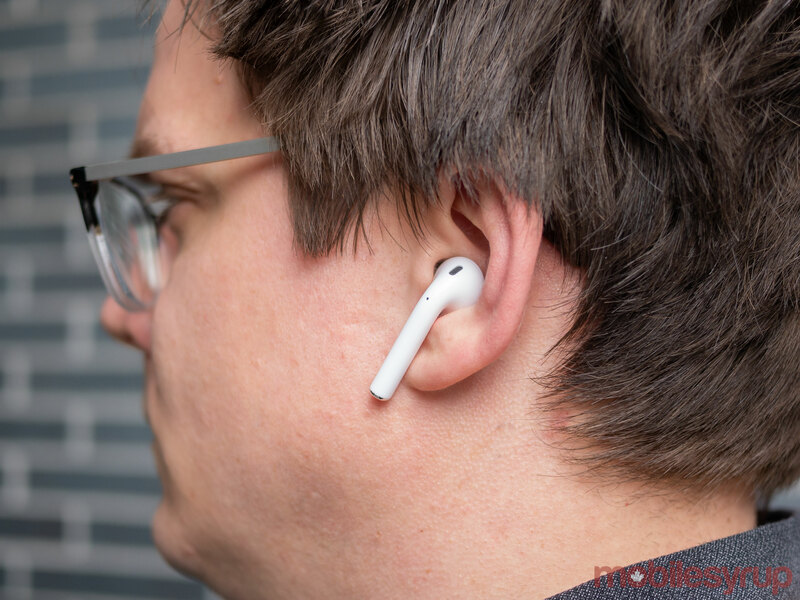 The H1 chip, an upgrade to the W1 featured in the first-gen earbuds, results in the AirPods (2019) connecting slightly faster. The AirPods still can’t connect to multiple devices at once, unfortunately. The connectivity experience in my roughly a week and a half with the new AirPods has been solid. The Bluetooth signal studdered and dropped less than it did with the first-generation AirPods and the instant connection functionality has worked flawlessly. The 2nd-gen AirPods also feature hands-free Siri interaction. Rather than taping the headphones to launch Siri requests, you can now say “Hey Siri” to activate Apple’s voice-activated assistant. Hey Siri operates great even under noisy conditions. For instance, it worked in the typically loud MobileSyrup office, as well as while walking down a noisy Yonge Street during rush hour in Toronto. I don’t think this is a feature I’ll find myself using very often since I’m not fond of talking to voice-activated assistants in public, but it’s nice that it’s there. Regarding battery life, the new AirPods still last roughly four to four and a half hours on a single charge in my experience. Apple says its H1 chip results in 50 percent more talk time. Though I didn’t test this claim, I did find that using the AirPods as a headset drained the battery at a slower rate when compared to their first-gen version. As you may have guessed, the charging case also still provides up to 24 hours of charge to the AirPods. If you were hoping the AirPods (2019) would feature improved sound quality, that unfortunately isn’t the case. They’re fine with a reasonably impressive sound stage and a level of bass you’d expect from earbuds, but don’t match other wireless earbuds regarding overall sound quality and bass. Generally, the AirPods sound decent regardless of what genre you’re listening to, though it’s worth noting the earbuds tend to feature recessed highs and overall hollow sound. As someone who uses the AirPods on the go for brief periods, typically while I’m walking to and from the train station to work, I’ve never found this to be an issue. If I used them as my only pair of headphones, I might consider this to be more of an issue. Just like with the first-gen AirPods, I find the convenience of instant connectivity vastly outweighs the AirPods decent but not stellar sound quality. There just isn't enough new in the slightly upgraded headphones to justify the purchase, unless you've been eagerly awaiting wireless Qi charging to come to the headphones. Even then you could purchase the $99 charging case separately and use it with the first-gen AirPods. The headphones desperately need some form of noise isolation and it's disappointing Apple hasn't included the feature in its second-generation AirPods. If you've been on the fence about the AirPods, or the battery life of your first-gen pair has diminished, these minor upgrades have made an already extremely convenient, but still average sounding pair of wireless Bluetooth earbuds, even better thanks to 'Hey Siri' integration and the addition of wireless charging. Regarding pricing, the 2nd-generation AirPods with a charging case come to $269, with the charging case also being available separately for $99 and first-generation AirPods costing $219. "these minor upgrades have made an already extremely convenient, but still average sounding pair of wireless Bluetooth earbuds, even better..."